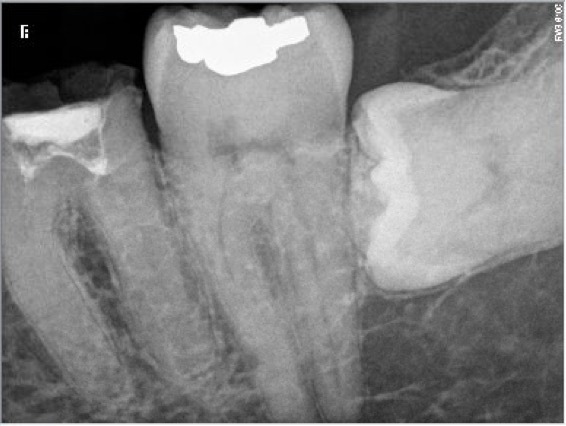 A) Never push a straight stainless steel file into the canal in order to reach the foramen with it. You must first bind your first instrument tip and scout in order to be able to feel and follow the canal shape or its direction change. B) In a case such as this one, you will most likely meet more than a point of resistance before reaching the foramen and you will have to carve your way in deeper. Pushing your way in at the point of resistance with your file will definitively create a ledge or else with their disastrous consequences. In order to progress deeper, you have to enlarge the coronal portion with your ss file using the enveloppe of motion technique. Continues this way until the desired length is achieved. C) Then, once the foramen has been reached, you can enlarge the canal in order to create a glide path up to size 15. Once the glide path has been completed you could use the NiTi shaping file of your choice. Needed state of mind NO pushing but strong resolution. Endodontic procedure instrumentation has been performed with Mani stainless endodontic K files and ProTaper Universal (Dentsply). Chelator: RC Prep. PUI Irrigation: NaOCl 5%. The name comes from the letter “C” shape appearance of a very large isthmus in the pulp chamber floor when viewed from above. 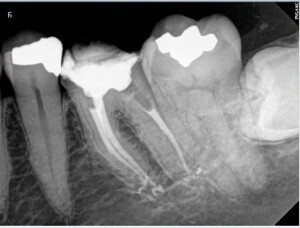 This isthmus or groove is the result of the merging of some or all of the root canals at the cervical area near the pulp chamber floor. Incidence is 2,7% in Caucasian and up to 13% in asian population. “C” shape canals are a real challenge to preparation of root canal treatment and may cause technical complications such as transportation, steps, stripping with perforation in the thin wall area or blockage of the canal. The following link to a short video of the tooth in 3D gives a better understanding on how difficult the cleaning and filling tasks of a “C” shape root canal may be. This procedure requires a full understanding of this anatomy to prepare an optimal access cavity to pulp chamber, to know where to look for the root canal entries and to be cautious about the thin wall area. This endodontic procedure also requires much more operating chair time for debridment. 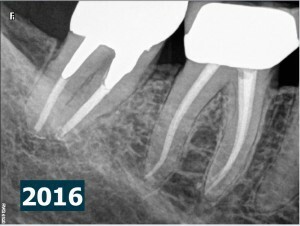 No rapid techniques does exist to shape clean and fill those peculiar root canal shapes. 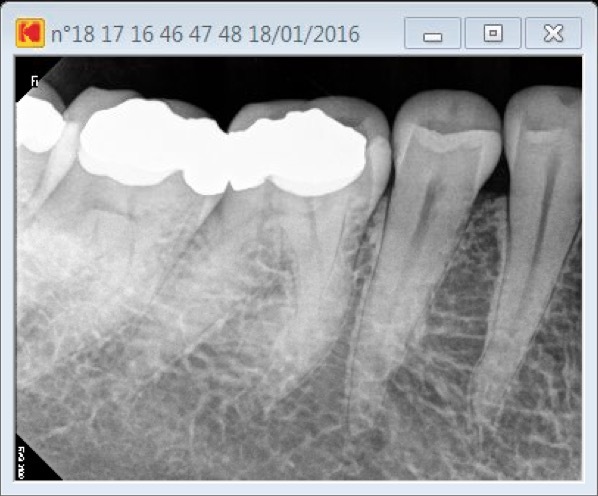 This specific endodontic procedure also justifies the use of a dental operative microscope to better see what we are doing and lower the risk of procedural mistakes. 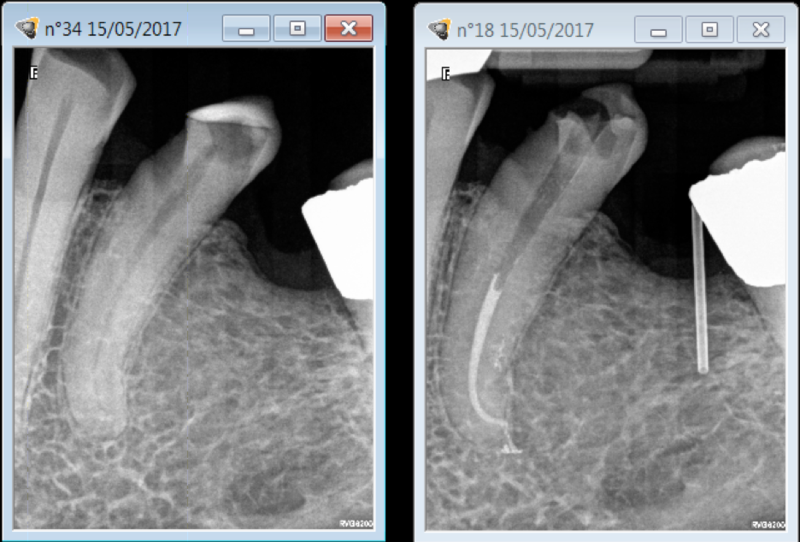 Tooth torsion , tooth distal inclination , root canal severe curvature and 3 different techniques for numbing made this root canal procedure a challenging one. 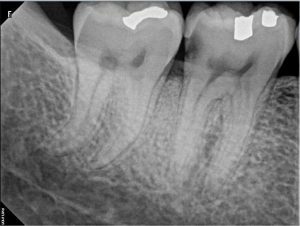 In some rare instances, a molar may have two distal root instead of one. 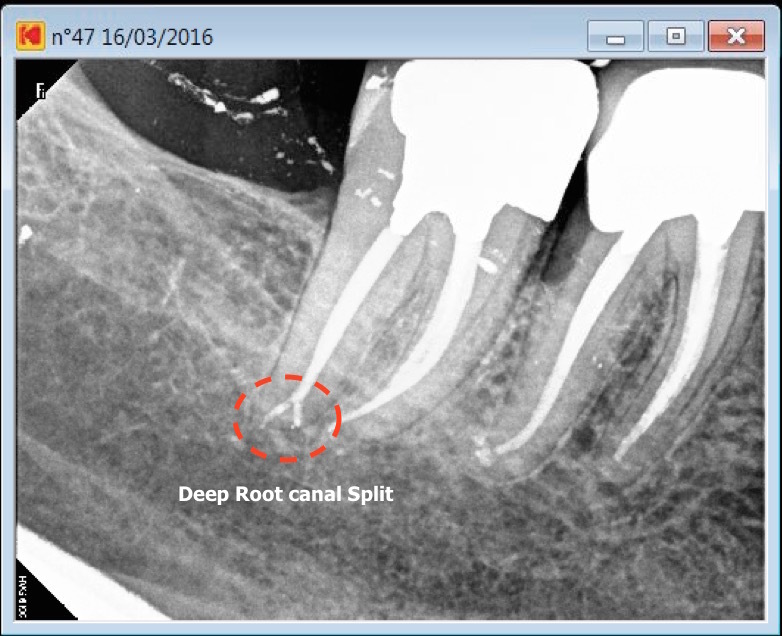 Leaving this extra root untreated may lead to a complete root canal therapy failure. This patient came into our office on an emergency basis, thanks to the magnification, the supernumerary root canal entry could rapidly be located allowing for this procedure to be completed in a single setting. Anatomical variations must be considered at the beginning of the root canal treatment. 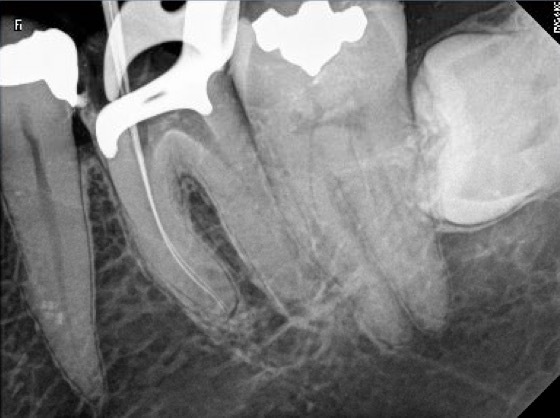 Even though at this point, accurate preoperative radiographs are considered essential giving indications to clinicians as to the number of roots and canals that exist in a tooth, adequate examination of pulp chamber floor with the help of magnification and co axial illumination may give to clinician much more extensive information about number, position of pulp canal orifices and wall anatomy. In this rare anatomical variation 3 canal entries could be located: 1 in palatal root, 2 in distal root, and only 1 in the mesio vestibular root. The mesiovestibular single root canal entry did split into two canals at a depth of 2mm below the pulp chamber floor level. On July the 29th 2009, we have been presented with this mandibular second molar. Patient was experiencing pain. 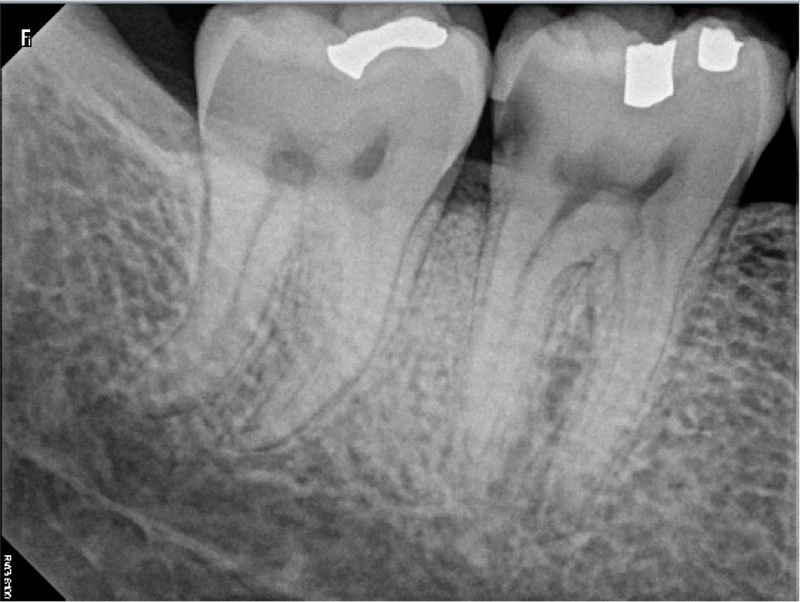 This radiographic image showed a huge radiographic J-shaped lesion in the mesial aspect of the mesial root. Back then, according to some experts, this type of lesion along with a deep narrow probing was considered as a pathognomonic sign of a vertical root fracture. Since vertical root fracture has a hopeless prognosis, standards of care would have commanded its extraction. In the presence of such a periradicular tissues loss, extraction would have also been indicated in the event we were dealing with a periodontal infection. Still, what if we were dealing we an endodontic infection? 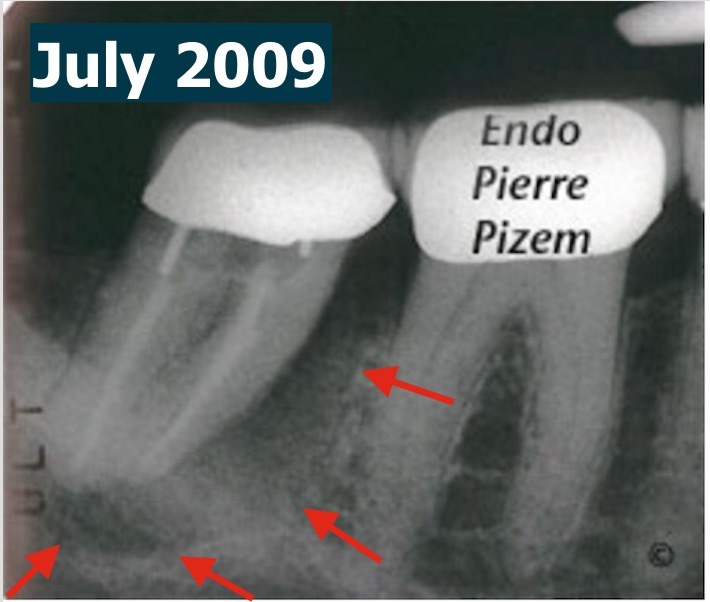 If this was the case, an endodontic revision (endodontic retreatment) would suffice to preserve this tooth. 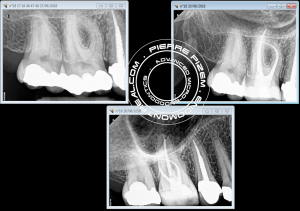 The decision of extracting or saving that tooth has been based on a foundation of sound diagnosis, as we opened the existing PFM crown to confirm the presence of a crack which we could not find. 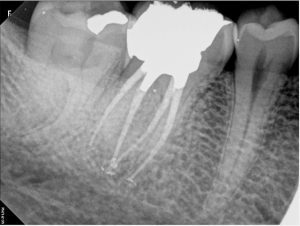 An endodontic revision which implied an interim calcium hydroxide has proven to be the correct approach, no dental implant needed here. 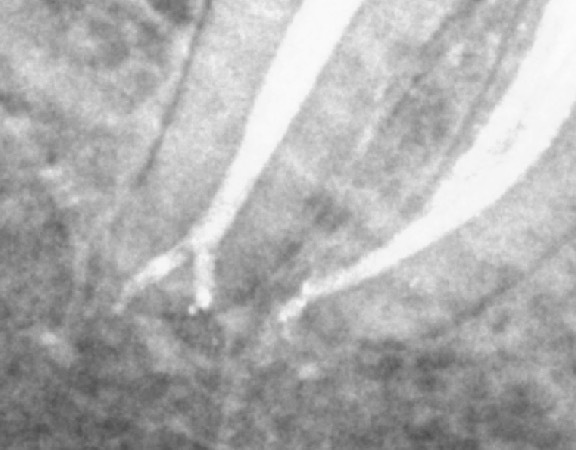 Root canal system is barely visible on pre operative dental X ray image indicating almost complete pulp chamber and root canal stenosis. 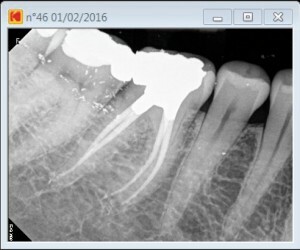 Root canal calcification build up represents a challenge for the practicionner when attempting to locate canal entries and when performing root canal shaping and cleaning. Endodontic microscope has been most helpful in this case to uncover the pulp chamber without perforating the chamber floor. One must not decide a tooth extraction on the sole basis of an x-ray observation. 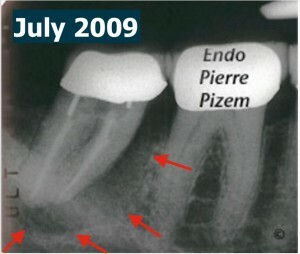 In cases of complete calcification of root canal systems, the prognosis of teeth that require an endodontic procedure will not become evident until the practitioner has initiated an endodontic treatment to determine whether the canal can be completely negotiated and then adequately disinfected and filled. 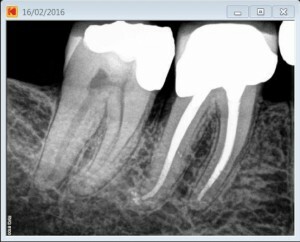 Thus root canal procedure should always be attempted even if teeth are presenting with narrow or non-existent root canal. In this specific case, the endodontist operative microscope from Zeiss was most helpful when striving to find the three narrow canal entries hidden under a layer of Russian red. 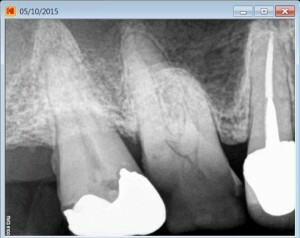 This microendodontic case study also enlightens how dental operative microscope may assist the practicing dentist into a more secure root canal procedure for his patient. Root canal shaping was completed with stainless steel K endodontic files in conjunction with the Pro Taper system from Dentsply. Chelating agent: RC Prep. 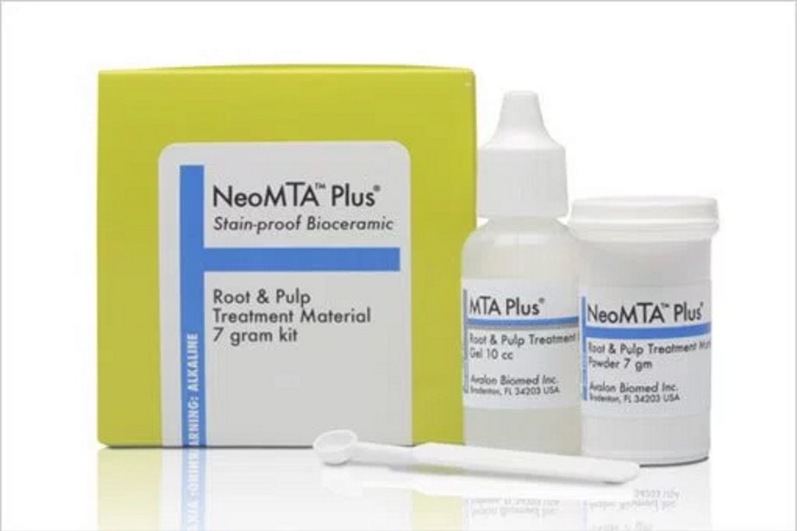 Root canal obturation was completed with gutta percha and Pulp canal Sealer from Kerr using the warm vertical condensation technique. 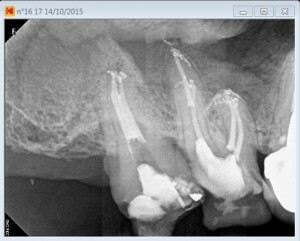 Patient has been referred for root canal treatment on both first and second maxillary molars. 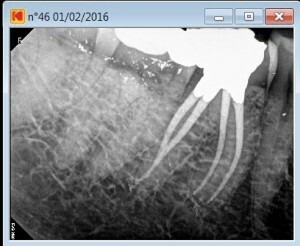 Tooth number 16 had necrotic pulp and tooth 17 presented with irreversible pulpitis. Patient was taking both antibiotics and analgesics. To alleviate patient’s pain, both teeth had to be simultaneously cleaned and shaped during the first setting. 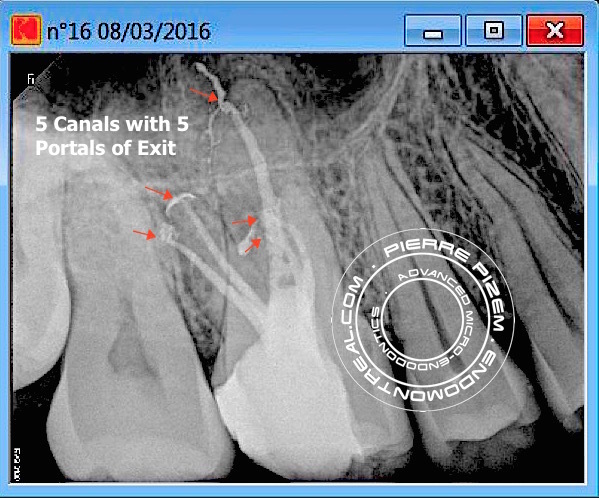 A pulpectomy on 17 and a cleaning and shaping of 3 canals of tooth 16 have been performed. An interim calcium hydroxide dressing has been inserted and patient had to come back in order to locate clean and shape the second mesio vestibular. During the second appointment the dental operative microscope allowed us to uncover and treat both an apical split in tooth number 17 and a fourth canal in tooth 16. 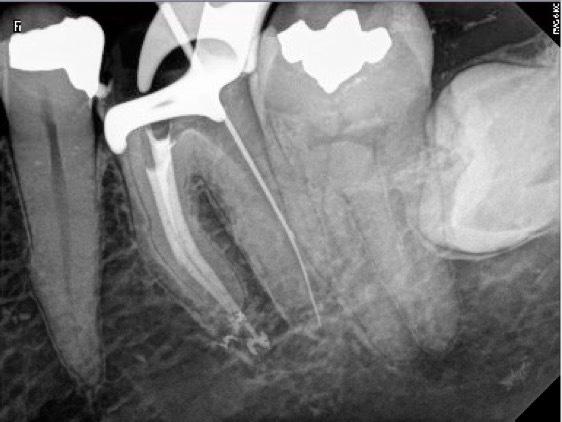 Despite the fact that on the pre operative X Ray image tooth number 17 seemed to have a single large canal, it ended up being a Vertucci type 5 root canal configuration (a single canal splitting in two branches short of the apex). As for tooth 16 a second mesio vestibular was expected to be present in its mesio vestibular root, still, dental operative microscope has there too been very useful when trying to locate it. Access opening has been performed with a combination of a 556 cross cut and a round tungsten carbide bur (Friction Grip). Operative field observation has been enhanced with high magnification and coaxial xenon lamp illumination (Carl Zeiss OPMI PROergo dental operative microscope). Dystrophic calcifications have been removed from pulp chamber with ultrasonic diamond coated tips in order to expose the second mesiovestibular root canal entry location. 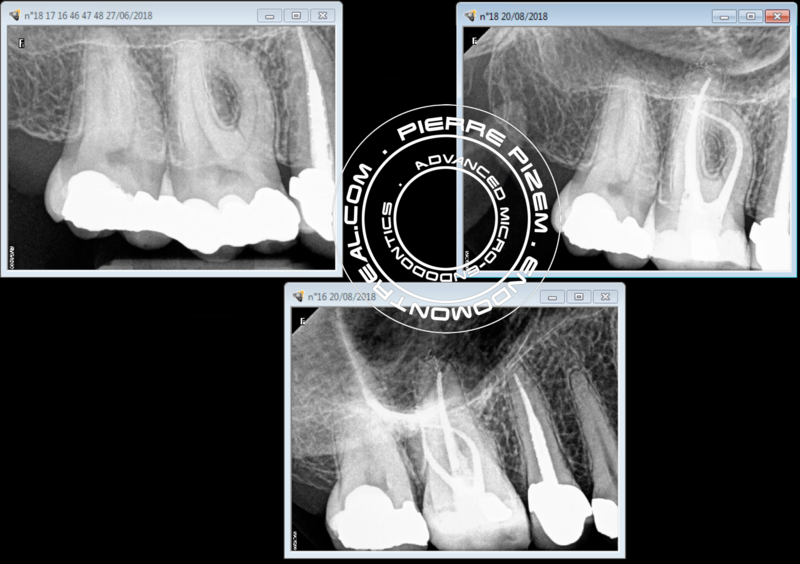 Instrumentation has been performed with Mani stainless K files and ProTaper Universal (Dentsply). Chelator: RC Prep. PUI Irrigation: NaOCl 5%. Ultrasonic tip: BUC One from Spartan. 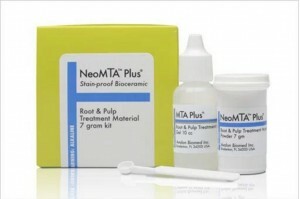 P5 (Dentsply) Sealer used: Pulp Canal Sealer. Obturation technique WVC. X Ray Sensors used: CareStream Kodak 6100.